In our system, a "shift" is the time one helper is scheduled for a day. So, for example, if between 8am-5pm you need 4 cashiers, this would be 4 different shifts in our system. 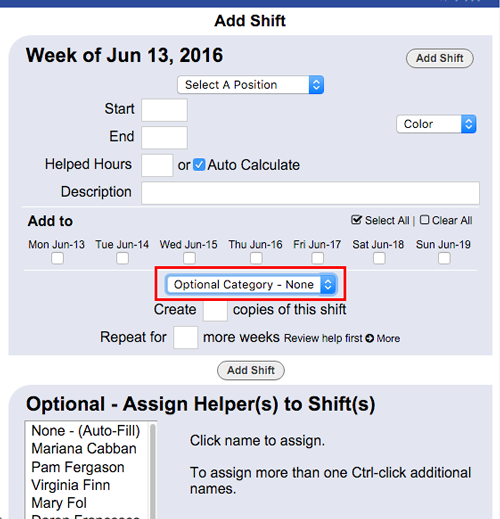 Normally it is best to use the By Helper schedule view to add shifts because it allows you to quickly add shifts without the page reloading each time. To add a shift on that view, you can click the cell that corresponds to the helper/day OR you can use the Add Shifts button on any schedule view (see instructions below). The only information required for adding a new shift is the position, start and end time, and day(s) to add the shift. Below is an overview of the many options that can also be chosen when adding a shift. Keep in mind that normally you will be using Import to bring in your shifts each week - after adding your initial week's shifts, you should only need to add shifts if you need more than you had the previous week. Note: After adding the shift(s), the window will stay open for you to enter another shift. For your convenience, the Position, start and end times, etc., are defaulted for the next shift. To change the times, simply click and type in the new times. When you are finished adding shifts for all of your Positions, click Done, and the window will close. Your schedule will now display with the new shifts and you are ready to make any needed changes so AutoFill will make the best assignments possible for your shifts. Assign Helper(s) -You can assign a helper manually when adding a shift by clicking the helper name (to choose multiple helpers, hold down Ctrl and click multiple names in the list). In most cases, you will leave the assignment as None (unassigned) so that AutoFill will choose the best helper for you. Categories - If you have shifts with similar begin and end times over multiple Positions, you can create Categories for faster entry. Click the Category drop down box and choose Add / Edit Categories to create Categories with Add Shift default information (Ex. if you have similar night shifts for different positions, you can create a NIGHT Category and enter the defaults so that when you Add Shifts, you can first choose that Category, and the fields will be pre-populated but changeable for you). NOTE: When adding a shift, if you choose to assign a helper who is not set up to help for that Position, you will be given an opportunity to add that position for the helper in a new window. When that windows closes, you will receive the message "Your shift was NOT added" - you must click the Add Shift button again to then assign the helper to that shift.